It was the same old scenario for South Korea: dominating possession, but struggling to hit the net. South Korea beat Bahrain 2-1 in extra time to reach the quarterfinals at the Asian Football Confederation Asian Cup in the United Arab Emirates on Tuesday. It’s still a win, but the Taeguk Warriors would have wrapped up the match much more easily if they had more precision in the attacking third. Against Bahrain, coach Paulo Bento stuck to their usual 4-2-3-1 formation, but made two changes to the starting lineup used in their 2-0 win over China last week. 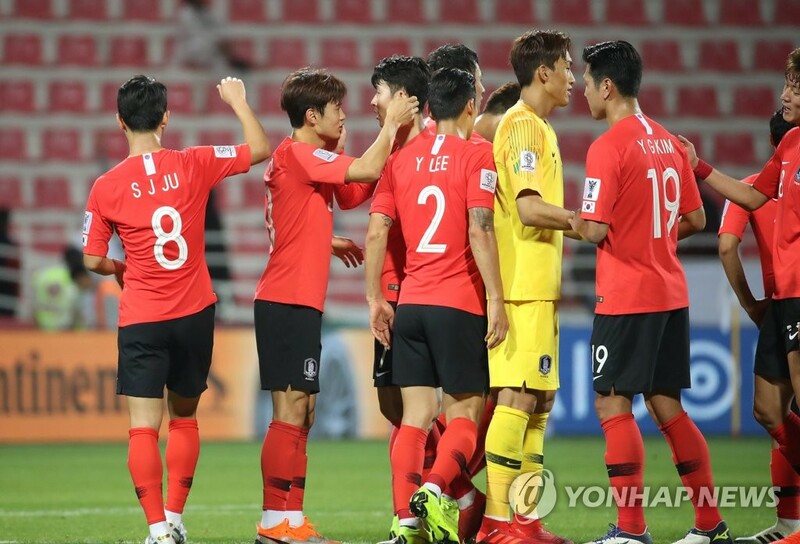 Right back Lee Yong returned after serving his one-game suspension from yellow card accumulation, while left back Hong Chul started ahead of Kim Jin-su. As usual in Bento’s style of play, the two full backs played wide and moved like wingers when South Korea had the ball. However, it was a lack of accurate crosses that made it difficult for South Korea to end the match in regulation. South Korea delivered a total of 30 crosses before the match entered extra time, but only one turned out to be successful. Hwang Hee-chan’s opening goal in the 43rd minute was a result of one fine cross from Lee. The veteran right back’s quick cross was parried away by Bahraini goalkeeper Sayed Shubbar Alawi, but the ball fortunately landed on Hwang’s foot to make the score 1-0. While full backs were responsible for attacking flanks, South Korea’s attacking ace Son Heung-min, midfielders Lee Chung-yong and Hwang In-beom were trying to create chances from the center. With his superb ball control and techniques, Son played behind striker Hwang Ui-jo, roaming open space between Bahraini center backs and midfielders. He drew fouls and fed key passes to teammates near the box, but still had a tough time breaking Bahrain’s fortress. Bahrain relied on counter attacks using forward Mohamed Al Romaihi and it turned out the Arab nation was efficient. Bahrain had four shots on target from 17 attempts, while South Korea posted two shots on target from 16 strikes. South Korea’s lack of concentration in winning second balls and sloppy passes also made the game difficult. Despite having 70 percent of the ball possession, South Korea didn’t manage to control the game effectively. South Korea’s duels success rate was 52.5 percent, only five percentage points higher than Bahrain. While South Korea had 11 interceptions, Bahrain marked 17. After surrendering an equalizer to Al Romaihi in the 77th, South Korea tried to boost their attack by substituting players. 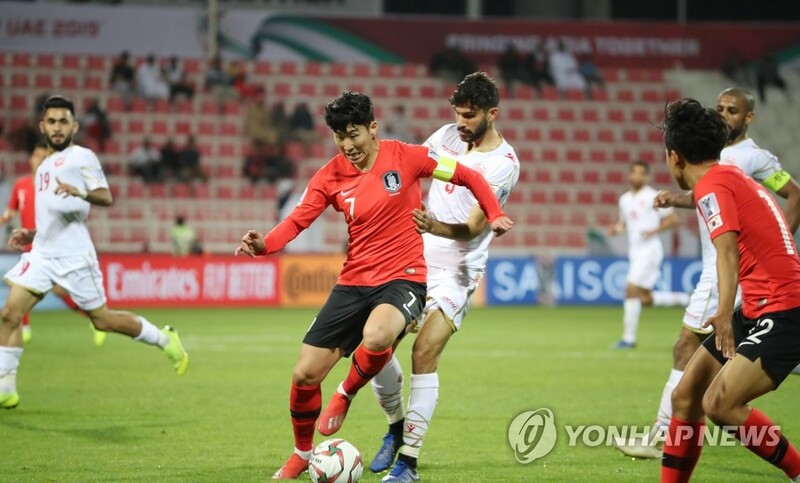 FC Augsburg’s versatile forward Ji Dong-won came on for Hwang Hee-chan in the 80th, while Hellas Verona attacking midfielder Lee Seung-woo made his first Asian Cup appearance by replacing Hwang In-beom in the 89th. This turned out to be a smart move as Bento apparently wanted to improve South Korea’s attack in center. South Korea’s attacking directions were concentrated on flanks before extra time. While South Korea had only 27.3 percent of ball movement in the center area of attacking third in the second half, this rate jumped to 31.5 percent in the first half of extra time. With Bahraini players running out of gas, Lee Seung-woo, who loves to cut inside and move the ball, added more pace in the front line, while Ji and Hwang used their power to challenge Bahraini defenders. But South Korea’s winning goal came from full backs and it was one accurate cross that changed the result. Lee Yong’s cross from the right flank found extra time-substitute Kim Jin-su, who headed down for South Korea’s 2-1 lead. In extra time, South Korea had five crosses and two were successful, a big improvement on accuracy compared to what was done in regulation time.